Artists strive on consistency in style when paving through the industry, creating something identifiable and unique. The challenge there is the diversification of the style while retaining its distinct elements, creating an exploration of mediums, techniques and narratives. Jomike Tejido, who was known for his artworks on woven mats (banig), did such an exploration on his oeuvre. He introduced his banig-artworks by simply utilizing the mats as an alternative to traditional work surfaces like paper and canvas. He used this mat (native to East Asia, and particularly in the Philippines) to display an abstract geometric landscape akin to buildings and various organic elements like fresh produce, complemented by playful and bold colors. He has embraced this style throughout his years as a visual artist, until in 2018 when he caught glimpse of a refreshing way to narrate his style. Initially introduced in a group show that highlights the versatility of paper, Tejido was challenged to continue to incorporate his use of character banig in this, having been used to paint on it instead of integrating it on a traditional smooth surface. His first few pieces of this “experimentation” had such positive reception, that he extended the challenge into creating similar collage works on a more contemporary surface like acrylic glass. Tejido (b. 1982) is an alumnus of University of Santo Tomas with a degree in architecture. Aside from being an exhibiting artist, he also has contributions in the field of architecture and children’s book illustrations. He has been active in the art industry for a little more than a decade, exhibiting both locally and internationally. Most of his works are inspired by his architectural background, created with organic blocks and shapes and imbued with bright and narrative renderings. 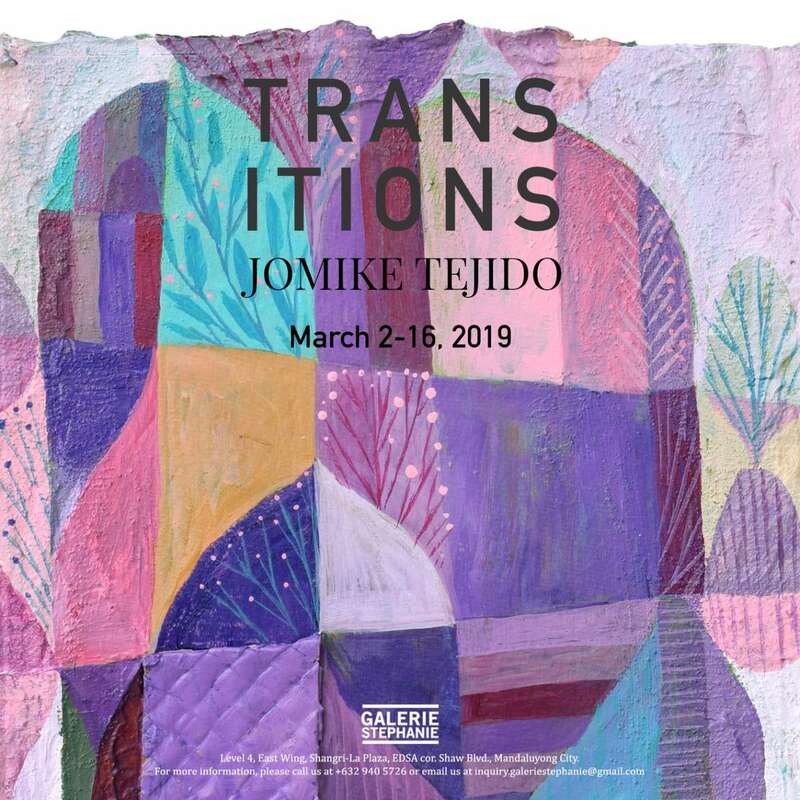 Transitions will have its opening reception at Galerie Stephanie on March 2, Saturday, 6PM. The gallery is located at the 4th floor East Wing of Shangri-la Plaza, Mandaluyong. Exhibit will be up for view until the 17th. For more inquiries, kindly call 940-5726 or email inquiry.galeriestephanie@gmail.com.